This was Queen’s last album to be composed of entirely new material. 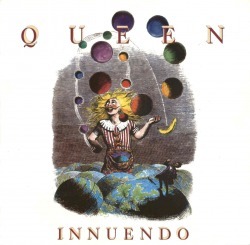 The song, Innuendo, was written as a tribute to Led Zeppelin. The album was recorded when Mercury was progressing into the final stages of his HIV/AIDS infection. Much of the material on the album deals with the band's coming to terms with his imminent death. The theme is also reflected in the music, as most of the album is heavy & arresting, bleak & dark, and at times both. "I'm Going Slightly Mad" was begun in Mercury's London house, after he'd got the idea of writing a song about madness, inspired by Noel Coward's camp jokes. Most of the lyrics (like "banana tree" or "one needle") came from both him and his friend Peter Straker, who stayed up all night in Mercury's kitchen, devising ever more outlandish lines. The song “Ride the Wild Wind” is a sort of sequel of Roger's "A Night at the Opera" composition, "I'm In Love With My Car", which focused on Taylor's passion for cars and race. This time, the song involved all of the other members, that gave life to a fast song with beating drums and rhythmic bass line, eerily note-for-note similar to The Smith's "Shakespeare's Sister", which create the sensation of speed and engine's roar. In the mid-part, a brilliant May solo, which accentuates the sense of high velocity, and also gives the song a heavier sound. In some parts a racing car can be heard. It was released as a single in Poland, peaking at number one. The music video for the song “These Are the Days of Our Lives” was Mercury's last appearance in a video medium. By the time the video was made, it had become impossible to disguise that Freddie was seriously ill. Despite his frail appearance, he appeared and gave what energy he had left, filmed in black and white. The black and white in the video helped somewhat to reduce the ill/frail appearance. When footage of the band making the video was released in colour, it is clear to see why. Brian later credited Jeff Beck's 1989 song "Where Were You" as the inspiration for 'Bijou'. In the US, Queen launched the album with a part aboard the old British liner Queen Mary, permanately docked in Long Beach, CA. Steve Howe from Yes played "Additional Wandering Mistrel Spanish Guitar Somewhere in the Middle" of the title track.